This PDF 1.5 document has been generated by Microsoft® Office Word 2007, and has been sent on pdf-archive.com on 04/10/2016 at 05:58, from IP address 47.15.x.x. The current document download page has been viewed 245 times. File size: 816 KB (36 pages). The pay scales indicated above are due for upward revision w.e.f. 01/01/2017. Persons With Disabilities/ Physically Handicapped. the Corporation from time to time. eligibility, as per the policies of the Corporation from time to time. depending upon the actual place of posting. India orders; wherever posts are reserved under these categories. 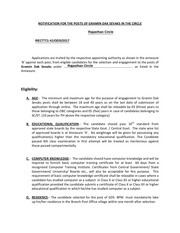 that as on last date of receipt of application, the candidate should have at least 5 years of service left. 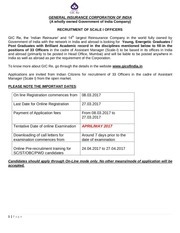 (viii) The number of posts indicated in the advertisement is tentative and may vary as per actual requirement of the CWC. category of disability; candidate will not be considered for any relaxation / concession at any stage of recruitment. there will be a skill test apart from online test and shortlisted candidates will be called for document verification. Candidates are advised to regularly keep in touch with the CWC website www.cewacor.nic.in for details and updates. category other than in which applied will be entertained. OR Zoology with Entomology from recognized University/ Institution. Accounts in Industrial / Commercial /Departmental Undertakings. 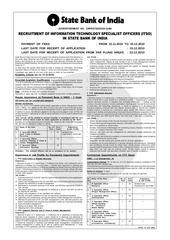 certificate as applicable for the post as on last date of the application. 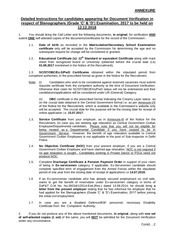 The minimum eligibility w.r.t. the post. Candidate appearing in final year/ final semester are not eligible to apply. In case of MBA Dual Specialisations, one of the fields of specialisation should in the fields prescribed for the post. 5 years of service left. Magistrate within whose jurisdiction she/he had ordinarily resided or any other authority designated in this behalf by the Govt. on last date of receipt of application i.e. 13.10.2016.
maximum age limit prescribed for the Post by more than 3 years (8 years in case of SC/ST; 6 years in case of OBC Candidates). Age concession is not admissible to sons, daughters and dependents of ex-servicemen. c) who has been released from such service as a result of reduction in establishment. Ex-Recruits boarded out or relieved on medical grounds and granted medical disability pension. are NOT eligible for claiming benefits of reservation under EXS Category. However, they are eligible for age relaxation. rendered in the Armed Forces for purpose of age relaxation. Armed Forces within the stipulated period of one year from the closing date. or unreserved posts and such exemption cannot be termed as relaxed standards in regard to age. certified by a Medical Board constituted by the Central/State Govt. Regional Offices/ Corporate Office as identified by the CWC. means loss of sixty decibels or more in the better ear in the conversational range of frequencies. 1, 2, 3, 4 &amp; 7) scribe may be from a stream different than the post. stand cancelled, irrespective of the result of the online examination. for every hour of the examination. request may not be favourably entertained. not be allowed such concessions. performance of function (minimum of 40% impairment). otherwise advised for every hour of examination. candidates who use the services of a Scribe for the examination. Extension, Horticulture, Animal Husbandry, Distribution &amp; Economic Scenario. This file has been shared by a user of PDF Archive. Document ID: 00490544.